This ‘Shib’ temple is in Bangladesh, not Uttar Pradesh. This photo is viral claiming this to be a Shiv Temple in Sambhal, Uttar Pradesh which was kept closed by Muslims for 35 years. New CM Yogi Adityanath opened it by sending police. The fact is, this temple is not in Uttar Pradesh or even India for that matter. This Temple is of Shiv Bhagwaan, ‘Shib’ pronounced in Bengali accent is in Bangladesh, it is 500 years old. Local Hindus have stopped visiting it because of its dangerous condition. They asked local Government to repair it but they haven’t. 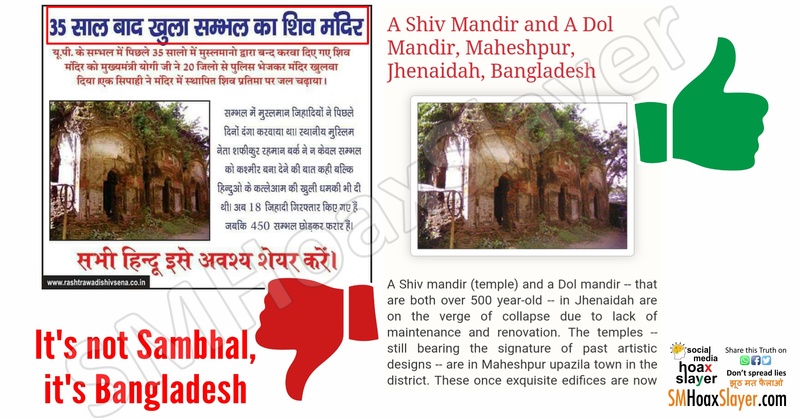 A Shib mandir (temple) and a Dol mandir — that are both over 500 year-old — in Jhenaidah are on the verge of collapse due to lack of maintenance and renovation. The temples — still bearing the signature of past artistic designs — are in Maheshpur upazila town in the district. These once exquisite edifices are now in shambles as weeds have taken over causing cracks; no restoration has been done, seemingly, since their creation. The temples are located 45 kilometers to the west of the district town, and are believed to have been built during the reign of Shaista Khan in the 1600s (mid to late). Both temples follow the ‘jor-bangla’ style (with a ‘chala’ style roof), typical of this region. Although time and nature have damaged most of the terracotta plaques on the temple walls, their shape and structure still bear authenticity of the heritage they are part of. The roof of the Shib mandir is inwardly concave with a thickness of 3.6 feet, and the temple stands 25 feet high. Cracks have developed in the walls. Weeds are growing all over the structure, and it has become a shelter for stray animals. The Shib mandir has three domes. According to locals, Hindu devotees stopped coming to these temples around two decades back, since the structures became hazardous. They added that if the temples were not restored, a heritage site would be lost. Maheshpur Puja Udjapan Committee President, Ranjan Master said that no fund has been sanctioned yet for the repair of the temples since he was elected. He added that the committee can repair the temples if the government comes forward and grants necessary fund. ← ​Photo imported from Canada especially for MCD elections.